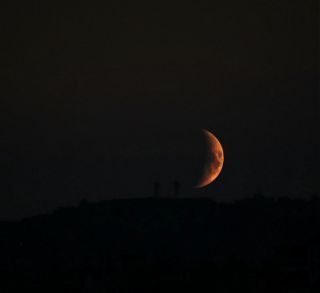 Astrophotographer VegaStar Carpentier took this image of the moon from the Eiffel Tower in Paris on July 24, 2012. Carpentier used an EOS Canon1000D, exposure of .0.4 seconds, ISO400. A waxing crescent moon sets over Paris in this stunning skywatching photo. Astrophotographer VegaStar Carpentier captured the scene from the Eiffel Tower on July 24, 2012. "I took this photo, the sight of this magnificent moonset in evening, from the first floor of the Eiffel Tower," Carpentier said. Moonset is when the moon appears to fall below the horizon. In this image, the crescent moon had 38.3 percent lunar illumination, a figure that signifies the fraction of the moon that is brightly lit. A waxing moon means the moon is getting larger in the sky, progressing from the new moon to the full moon. To take the photo, Carpentier used an EOS Canon1000D camera, with an exposure of .0.4 seconds and ISO 400.